Projects - Turner Murphy Company Inc.
Project consists of the removal of (2) existing manual bar screens and replacement with channel-mounted electric grinders, power cables, controls, and lift-out system. Retrofitting existing openings above grinders and installation of access hatches and fall protection above grinders. Concrete rehabilitation and coating of channel interiors. Installation of (4) floor-mounted variable frequency drives, power cables, and controls. Removal and replacement of (4) motor controllers, associated power and control wiring, and raceways. Installation of new raceways for power cables, control wiring, and interior lighting. Coordinate instrumentation and control changes with equipment and electrical upgrades. All repairs, bypassing, and equipment installation to be performed while maintaining full operation of the PS. 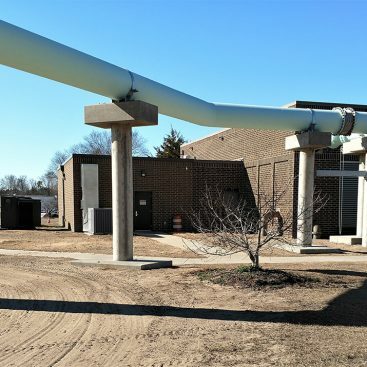 Rogerson Drive Pump Station is the second largest pump station in the wastewater collection system and is critical to overall wastewater flow management. Project consisted of the demolition of existing air piping, 800LF of new 30 inch air distribution piping with control valves & bellows supported both overhead & underground. Approximately 120 LF of 16-inch temporary air bypass piping. This project was critical to resolving GUC’s identified issues with compressed air delivery to the South Aeration Basins. An energy efficiency study quantified energy losses in the air piping of over $172k /year. Project included a new bridge supported sludge thickener structure and mechanism with supplementary controls, a complete sludge pumping station including two (2) submersible pumps, wet well, valve pit and station piping. New Landfill Leachate Treatment Plant is a new Reverse Osmosis plant to replace their outdated system used to treat landfill leachate. 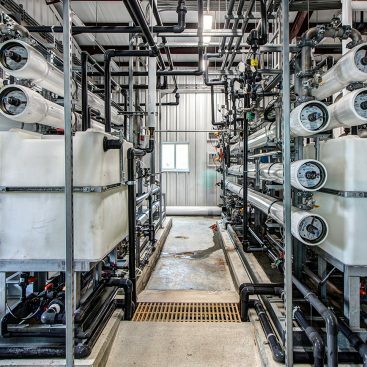 Project included Influent and Effluent Pump Stations, Influent forcemain, Ultrafiltration units and (2) Reverse Osmosis Process units, Chemical Feed, PEMB, MCC, SCADA Laboratory and associated sitework. 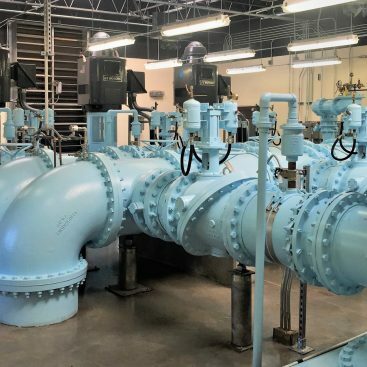 Project Consisted of (2) New 100 HP high service vertical turbine pumps with associated controls, new concrete platform and aluminum stairs, new flow meter vault hatch and miscellaneous improvements inside the high service pump station building. Project includes redundancy services for an existing WTP. Including two H.S. pump stations, Five 350 HP vertical turbine pumps in underground pump cans, MCC’s, VFD’s in two new buildings, 175 tons of 24” – 42” DIP U.G. yard piping w/precast meter vaults, valves and numerous tie ins. 30 tons of interior DIP piping – size 8” – 30”. 2300 L.F. of 12” PVC decant pipe to the Catawba River to include discharge piping and diffusers out into the river. 860 L.F. of 6” directional bore. Existing Lagoon – New submersible pumps, submersible mixers, floating decanters and divider wall. Project also included include electrical, site work, paving. PArt 2 of the contract consisted of 2,273 LF of 48″ DIP raw water force main including valves, tie-ins, and meter vault. 2014 Repair WWTP Shaw AFB & Wateree Recreation AFB Shaw AFB, SC $1,222,443.81 Shaw AFB Claro Company, Inc. Replacement of (2) 150 HP submesible pumps at Intermediate PS, (3) new clarifier bridges, clarifer coating and repairs, new filter backwash pumps,comminutor, blowers and SCADA work. 2014 Catawba River WTP Redundancy and Reliability Improvements Lancaster, SC $7,125,015.00 Lancaster Water and Sewer District MBD Consulting Engineers, P.A. New construction of a high service finished water Pump Station. This included (5) 400 HP Vertical Turbine Pumps with VFDs and associated switchgear. Project also included new electrical building to house (3) 600 HP VFDs with a 3000A switchgear with space for expansions for a separate HSPS. New Electrical Building was to service an existing pump station and replace the VFDs and Switchgear. Swap over involved well-coordinated shut downs in very specific sequence while keeping the existing PS on line. We also installed 175 tons of 24” – 42” DIP Yard Pipe w/precast meter vaults, valves and numerous tie ins and shut downs. 30 tons of interior DIP piping – size 8” – 30”. 2300 L.F. of 12” PVC decant pipe to the Catawba River to include discharge piping and diffusers out into the river. 860 L.F. of 6” directional bore. Modifications to the existing backwash lagoon with new submersible pumps, submersible mixers, floating decanters and divider wall. Also to include electrical, site work, paving, and 2,273 LF 48” DIP for raw water force main to include valves, tie-ins, and meter vault. Project consisted of construction of a new sludge equalization basin with sludge pump station, new belt press building with belt press and conveyors, site piping. Project consisted or a 3rd treatment train. 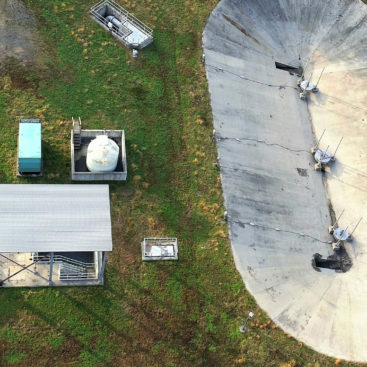 Plant was poured in place concrete to house flocculation chambers, settling plates, gravity filters and clear well. Project also include the addition of air compressors, blowers, effluent pumps, SCADA and a new drying beds. Project consist of removal and replacement of two existing 300 HP vertical centrifugal pumps with extended motors, new mechanical bar screen and screenings; washer/compactor in existing bar screen structure. New electrical building to house new MCC and VFD’s demolition and By-pass pumping to enable us to make the necessary tie ins and pump change outs. Site work, fencing and concrete paving. The project consisted replacing the both of the filter control panels and the plants main control panel with out service interuption. Proejct also included adding or eplacing over 3 dozen motor operated valves, new flow meters, cheical feed and assocaited electircal work. Project reqired extinsive planning and coordination for over 10 timed shut down and tie ins. 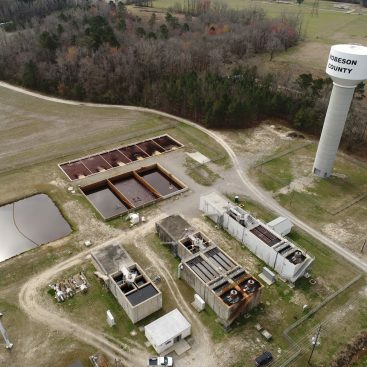 The project consisted of moving an existing out of service Packaged Steel WWTP in Harnett Co. to the existing Town of Spring Hope’s WWTP facility 100 miles away. Major on site piping rerouting and abandonment of structures onsite. The project also included the addition of an Emergency Backup Generator to the existing site and new facilities. Additional work was initiated to replace the existing influent pumps and to update various motors and parts on existing equipment onsite for a fully functioning facility. Funding was provided by USDA, Rural Development, and the Town. Construction of new stand alone Electrical building outside of existing Raw Water PS. New building house all new Switchgear, VFDs, controls sitework and retaining walls. Removal of two 55’ Diameter Clarifiers and Installation of two new Suction Pipe type Clarifiers by Amwell. Installation also included all now FRP weirs and baffles. While the Clarifiers were removed concrete repairs were performed that consisted of a coating of with a repair mortar and an epoxy finish coat. A large portion of the project involved a complete renovation of the existing SCADA system which included 7 new RTUs, PLC Programming, New CPU station, Instrumentation and integrating existing instruments to the new system. Installation of new lime silo with feed system, new water line, horizontal boring. Site work included Micropiles, grading and paving. Project consisted of a filter air scour system for the WTP and misc. concrete repairs. Concrete repairs on the 2 million gallon finished water storage clear well, including: Removal of loose and disintegrated concrete, Preparation of the surface, Placement, finishing, and curing of repair concrete or mortar, and Application of concrete waterproofing and clear coating system. Replacement of (4) 200 HP Influent Pumps and VFDs, New Pump Control Panel. Installation of Membrane diffusers at digesters, New SS Air piping and replacement of (16) 6″ Combo AR/PR Vacuum Valves on Effluent line. Install new Brush Rotors, New chemical feed storage and pumps, new submersible mixers and influent pumps. Project consisted of construction of new water treatment plant with pressure filter, softener, detention tank, aeration, masonry, operations building to house equipment, lab, chemical feed, yard piping, EQ basin, remote well sites (2), HVAC, paving, and grassing. Project consisted of installation of 32 backup generators at individual pump stations throughout the Asheville water system. Of the 32 sites, 25 were fixed sites involving clearing, grading, demolition, site improvements including fencing, retaining walls and site piping along with major electrical and SCADA upgrades. 7 sites were prepped for a portable Gen Set. Largest site at Mills River WTP included the installation of a 2250kw Gen Set indoors with a remote radiator and 10k gallon AST Diesel Fuel System. A new switchgear system was installed that now allows the plant to run on generator power and can put reverse power on the grid. Project was value engineered prior to start and sites were released as easements and acquisitions were obtained. Staged WTP renovations/additions, demolitions, new sed. Basin, filter rehab (8), new filters (4), existing filter building rehab & refurbishment, existing operations building rehab, new rooms & finishes, new chemical building, new plant chemical feed system new filter building, new flocculators, rapid mixers, R.W. intake, yard piping, yard & plant tie-ins, site work, paving, fencing, etc. Project was the construction of aeration basin, headwork’s structure, influent, effluent, and RAS Pump Station including clarifiers, disk filters and contact chambers, sludge holding tank, aerobic digester, chemical feed and demolition of existing structures and process piping. Project consisted of a new precast WWTP at a green field site. Project included, yard piping influent/effluent pump stations, chemical feed, aeration basins, digesters, non potable water system, clarifiers, disc filters and UV system. Green site WWTP with Influent/Effluent Pump Stations, Splitter Box, Digesters, Clarifiers, Sludge Holding Tanks, Drum Filters, UV Structure, Blowers, SCADA, Laboratory/Electrical Building. 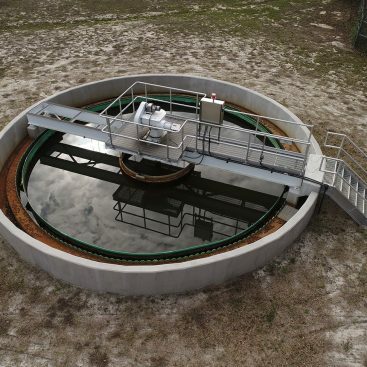 2007 Crowder’s Creek Pump Station & Equalization Basin Clover, SC $2,859,747.00 York County Purchasing Department Williams Engineering, Inc.
Project was the construction of 30’ deep Pump Station, Concrete Holding Lagoon, aeration, 7500 lf 16” DIP , 3500 lf and 6” PVC, Retrofit Existing Pump Stations, and site-work. For more information or reference to any the projects listed, please contact our office at 803-328-3874.